Issue: Preschools that serve children with developmental disabilities are paid significantly less than it costs to operate them; the state reimburses these programs at 94 percent of allowable cost and even less of actual cost. Chapters of The Arc New York can no longer subsidize preschool programs without endangering other OPWDD related programs. In addition, due to the teacher compensation gap between special education schools and public schools, we also continue to have extraordinary teacher recruitment and retention challenges. Preschools need appropriate growth factors and tuition rate increases along with other fiscal support to bring reimbursement more closely in line with the cost of operations. Research shows that investing in preschool programs has a significant return on investment. Position: We advocate for the following to support and sustain preschool and early intervention opportunities for children with intellectual and developmental disabilities: 1.) provide a 4% tuition increase for special education schools in 2018-19 school year; 2.) 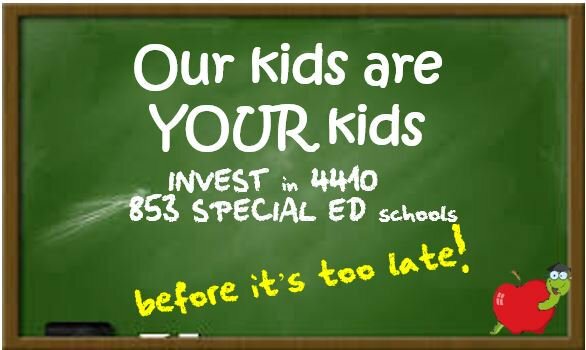 include statutory index for annual tuition increases for 4410 preschools and 853 special education schools, and establish a reserve fund to maintain fiscal viability; 3.) provide $18 million for special education schools to narrow the teacher compensation gap; 4.) set aside Universal Pre-school (UPK) seats to ensure classroom integration with 4410 special education preschools; and 5.) provide a 4% Early Intervention rate increase to address 20+ years of flat/decreasing rates. Update: The Assembly and Senate stand with our schools but they are not the ones who make decisions on tuition increases. Tuition increases are negotiated by State Education Department (SED) and the Division of Budget (DOB). SED is beginning to prepare the rate letter that they will send to DOB. The Board of Regents can be instrumental in influencing what SET will request. Here is a letter to email/send to our local Regent Roger Tilles and Members at Large Lester W. Young, Jr., Wade S. Norwood, James E. Cottrell and Luis O. Reyes drawing their attention to our inadequate funding, teacher shortage crisis and discrimination against our kids! While they understand #OurKidsareYOURKids (their kids), they need to hear from you to remind them to take action now! Please send your letter no later than April 15 — but the sooner the better. Issue: Medicaid is the backbone of services to people with developmental disabilities across the nation, and particularly in New York State. Medicaid comprises approximately 90 percent of the funding to the Arc New York and other developmental disabilities providers in our state. Cuts to Medicaid funding would prove devastating to the families we serve and services we provide. If previous attempts to repeal and replace the Affordable Care Act (ACA) had been successful, the cuts would have cost New York State between $4 billion and $7 billion in federal Medicaid funds. That represents nearly a 10% cut to all Medicaid providers, and would devastate the state’s system of programs and services for people with developmental disabilities. Medicaid is still at risk. Advocates stopped previous attempts to repeal and replace the Affordable Care act, but key members of Congress continue to target Medicaid as a solution to contain the nation’s growing federal deficit. Proposed actions include cuts to the Nation’s Medicaid program, and attempts to eliminate it as an entitlement program by converting it to a block grant or per capita cap system of reimbursement to states. Position: The Arc New York, along with thousands of other developmental disabilities providers and advocates across the nation, will vigilantly defend the Medicaid program from any actions in Washington that reduce federal Medicaid funding. Issue: Direct Support Professionals (DSP)s provide daily care, services and supports to people with intellectual and developmentally disabilities 24 hours a day, 7 days a week. Caring for people with complex needs is a rewarding yet challenging job, which requires ongoing training and a high-level of responsibility and skill. These are not minimum wage jobs. Nonprofit provider agencies funded by OPWDD employ nearly 100,000 DSPs, and deliver 85 percent of the needed services to approximately 130,000 people with intellectual and developmental disabilities in New York State. Almost all funding for these agencies comes from the government at rates set by the government. Statewide, reimbursement for DSP salaries has increased just 1.4 percent per year over the last eight years. Despite the high demands of the job, DSPs currently earn on average between $10 and $13 per hour. We are losing our DSPs to higher-paying entry-level job sectors, which continue to increase their hourly wages. In 2017, our statewide vacancy rate for DSPs was 14.4%, a 30% increase from 2016 and an 80% increase since 2014. Many agencies throughout the state are faring even worse, with vacancy rates in excess of 20%. Turnover rates are also problematic, with nearly one in every three DSPs leaving the job in less than a year. It is absolutely critical that we secure adequate government funding to pay our DSPs a living wage. If we do not, our programs could be reduced or eliminated due to lack of staffing, and many years of progress toward community integration, choice and deinstitutionalization will be lost. State-run programs and staff are reimbursed at a higher rate than those in the voluntary sector. If nonprofit programs are eliminated due to insufficient staffing, those still-needed services would likely be provided by state agencies, at a higher cost to taxpayers. To address the workforce crisis, The Arc New York helped create a coalition of all of the major developmental disability provider agencies in New York State and was one of the driving forces behind the #bFair2DirectCare campaign. While we were successful in 2017 in getting the Governor and Legislature to include $191 million in the enacted state budget to provide two consecutive 3.25% wage increases for DSPs, that is not enough to fully fund living wages for DSPs. Position: We will continue to advocate with our #bFair2DirectCare coalition to secure living wages for DSPs. Issue: Thousands of New York State citizens with intellectual and developmental disabilities are waiting for placement in a community residential setting, and many are in immediate need. The state has not provided an adequate way for families to plan for the future when providing care at home becomes difficult or impossible. People with intellectual and developmental disabilities and their families face an onerous placement process without a clear understanding of that process or the extent of their wait. However, while thousands await suitable placements, many residential vacancies go unfilled. Vacancies within certified residential settings have grown in recent years because of an administrative requirement to fill the opening with someone from the “Emergency Need” placement category. Often, the care needs and behaviors of these individuals are incompatible with the home in which the vacancy exists. In these cases, the vacancy remains unfilled, despite the fact it may be a suitable placement for individuals from the Current Need or Substantial Need categories. Offering housing almost solely on an emergency basis, makes it impossible to guarantee placements will be found in the most appropriate, least restrictive home environment. These restrictions also lessen the individual’s opportunity for choice in their own housing. We are working with OPWDD to improve the flexibility and timeliness of the placement process, to more expeditiously place individuals into available vacancies that compatible with their needs. The Arc New York will also continue to collaborate with Keep the Promise Family Coalition to advocate for solutions. Position: We continue to advocate for increased residential development, and an improved placement process, especially for people living at home with aging caregivers. We propose the following actions be taken to ensure there is sufficient residential development to meet the growing need to 1.) transparently assess the number of people who have requested or need residential services and keep a wait list with a publicly available summary; 2.) streamline the eligibility process so that people on the wait list can have their eligibility rapidly assessed and established; 3.) make administrative enhancements necessary to more efficiently match people seeking placement with existing vacancies; and 4.) provide capital and operating funds to establish as many new residential opportunities as necessary to meet the needs of New Yorkers with intellectual and developmental disabilities, particularly for those individuals with behavioral and psychological needs. Issue: Even though many people with intellectual and developmental disabilities want to work and have the skills to do so, there are limited employment opportunities available to them. As a result, the majority of adults with intellectual and developmental disabilities are either unemployed or underemployed. The Arc New York recently initiated the Customized Job Programs legislation (S.3932-A/A.205-A), sponsored by Senator Young and Assemblyman Santabarbara. This bill would establish a pilot program that subdivides state jobs into simpler component parts to provide opportunities for minimum-wage, integrated employment for people who could effectively perform some, but not all aspects of a job. Position: The Arc New York supports increased employment opportunities for people with intellectual and developmental disabilities, and will work to: 1.) enhance employer tax credits for hiring people with disabilities; 2.) secure additional funding for job coaches and other supports; 3.) create new state job opportunities for people with intellectual and developmental disabilities; 4.) pay a subminimum wage when appropriate; 5.) pass the Customized Job Programs legislation; and 6.) continue to transform sheltered workshops into integrated businesses where appropriate. Unsure of who your representatives are? Find out at www.commoncause.org/find-your-representative.